When we visited Drew Estate in May, Jonathan Drew called Ecuador the “Land of Milk and Money.” Given the number of Ecuadorian wrappers at this year’s Trade Show, it would be hard to argue. 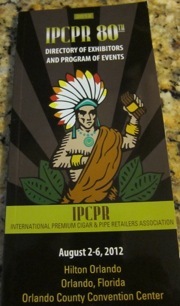 It seemed like every other new release featured an Ecuador-grown wrapper. Mostly it was Ecuadorian Habano, but there was plenty of Ecuadorian Connecticut too (and to a lesser extent Ecuadorian Sumatra). I think this can be attributed to two factors. First, quality Ecuadorian wrapper is widely available at reasonable prices, or else it wouldn’t be so widely used (while other popular wrappers like Connecticut broadleaf cost more if you want top quality). Second, the consumer market for Ecuadorian wrappers (particularly Habano) is expanding. Personally, I’m pleased with the development since Ecuadorian Habano has been a favorite of mine for many years—long before the current hype. Altadis USA and General Cigar always sell more cigars than the smaller brands and boutiques that get disproportionately more attention at websites like this one. (After all, while numbers are hard to come by, we’re told Macanudo is still the best-selling cigar brand with Romeo y Julieta running second.) But this year it seemed that both large companies were not content to rest on their laurels. The Altadis booth was notably busier than the two previous years (when, at times, it seemed like a ghost town). In the past, Altadis USA seemed like nothing more than a holding company for Cuban cigar trademarks, waiting for the embargo to end. General Cigar (Swedish Tobacco Group) has been more proactive, but it often played into the stereotype as a big company oblivious to the hard-core cigar smoker, focusing instead on the larger middle of the market. This year both companies seem to be doing a better job of meeting the expectations of the most frequent and discerning smokers while still appealing to the more occasional cigar smokers. At least on our site, both the new Montecristo Epic and the CAO Concert have already earned high marks from my colleagues as interesting, complex cigars, and there may be more high ratings to come. One of the most interesting conversations I found myself having repeatedly was about the introduction of 6 inch by 60 ring gauge cigars. Practically no cigar maker really seems to prefer the format, but it’s hard to find any new blends that don’t include the “Gordo” (6 x 60) size. Nearly universally, cigar makers and brand representatives I spoke with said they personally liked smaller sizes, usually coronas, lonsdales, and lanceros (or sometimes robustos and toros). But the Gordo size was far more common than any of those smaller ring gauge sizes. There was no getting away from the large ring gauge format for a simple reason: they sell. Nearly everyone says that behind the toro and robusto, the Gordo is the next best-selling cigar size. So, like them or not, Gordos will be an industry staple going forward. Ecuadorian Habano is the bomb. Ecuador Habano – Cream, Pepper and Leather.